Looking for some printable Bridal Shower invites? These free bridal shower invitations are beautifully designed for your shower. Print on white paper for a crisp, stylish look. Or use a gentle cream color for a vintage effect. 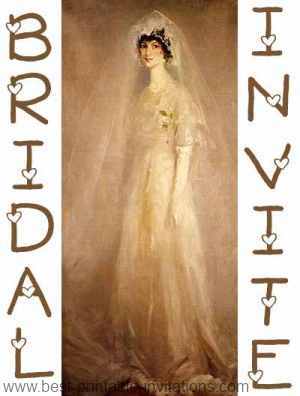 This beautiful vintage sepia image of a bride makes a romantic and gentle shower invite. Make a statement with this beautiful wedding scene invite. The gentle coloring makes a great statement. Wedding Scene Bridal Shower Invitation. 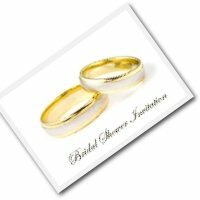 Would you like wedding invitations to match your bridal shower invites? You can print your own wedding invitations to match! Taking a little time over choosing your printable bridal shower invites will make you feel a lot happier over the finished result! It often helps to print out several invites before choosing - they can look a lot different on paper. For different effects try different paper types. A rough cream paper will give a parchment or vintage effect. Whilst a crisp white paper gives a more modern look. Experiment and see what you like. 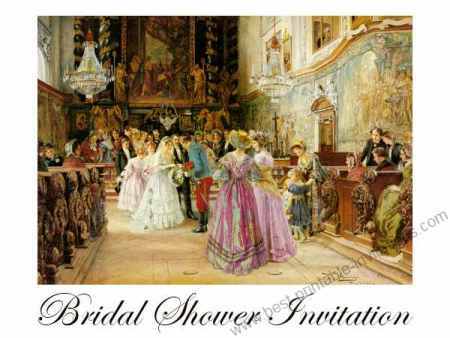 Don't forget to give full details of your shower in your invites. Include maps, directions, gift lists - and any other details your guests need to know. 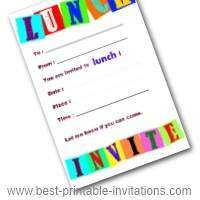 Make a checklist and follow it carefully as you put each invite into it's envelope.